Maathai was born April 1, 1940 in Nyeri District, Kenya. She earned her Bachelor of Science degree with a major in biology and minors in chemistry and German from Mount St. Scholastica College (now Benedictine College) in 1964 and her Master of Science degree in biological sciences from the University of Pittsburgh in 1966. In 1971, Maathai earned her Doctorate of Anatomy from the University College of Nairobi, making her the first East African woman to receive a Ph. D. She also taught at the university where she campaigned for equal benefits for women on the staff. Maathi also worked with the Kenya Red Cross Society and the Environment Liaison Centre where she came to believe that the root of most of Kenya’s problems was environmental degradation. In 1977, she led the planting of the first trees to conserve the environment in what became the Green Belt Movement. She encouraged, and paid a small stipend to, women to plant tree nurseries throughout Kenya. Maathi was also a leader of the pro-democracy movement in Kenya. In 2002, she was elected to parliament and appointed assistant minister in the Ministry for Environment and Natural Resources, a position she held until 2005. 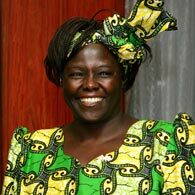 In 2005, Maathai was elected the first president of the African Union’s Economic, Social and Cultural Council. Maathai has published several books, including her autobiography “Unbowed: A Memoir” (2006), “The Challenge for Africa” (2009), and “Replenishing the Earth: Spiritual Values for Healing Ourselves and the World” (2011).